Its economic problems stem from political gridlock over how to pay for its commitments. One question that commonly arises in comparisons between Wisconsin and Minnesota is what about Illinois? On almost every measure, Minnesota has performed better than Wisconsin. This better performance has occurred during a period that Minnesota had a Democratic governor while Wisconsin’s was, and is, Republican. During this period Illinois has underperformed all of its neighbors. At the same time, Illinois has been a reliable Democratic vote in presidential elections. Does it follow, therefore, that Illinois’ underperformance results from “liberal” or Democratic economic policies? The most obvious cause of Illinois’s problems is its extreme underfunding of its pension obligations to public employees. For years, the state was placed at or near the bottom when it came to funding its commitments to future retirees. For example, here are the ratios of assets to liabilities for Wisconsin, Minnesota, and Illinois from the latest report on public pensions from the Pew Charitable Trusts. Wisconsin has a long-standing reputation under Republican and Democratic governors and legislature of running a well-funded state pension plan (as does the City of Milwaukee, but not Milwaukee County). 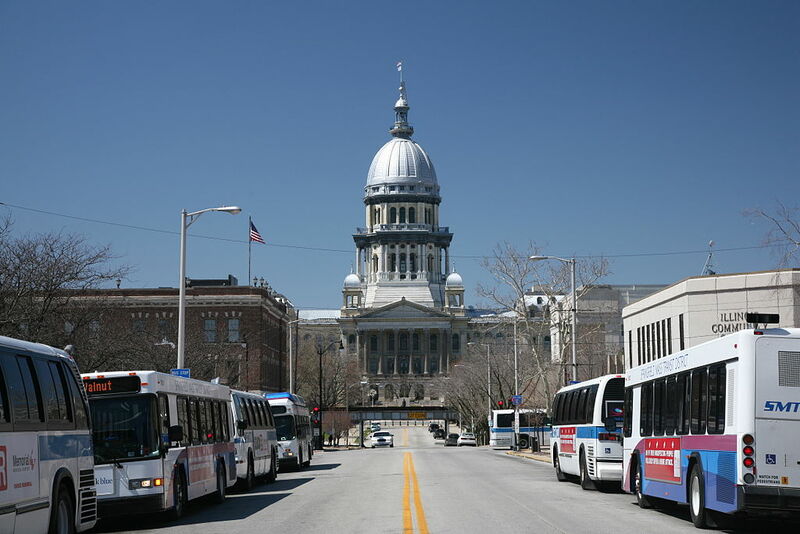 Probably more damaging than the underfunding itself is the inability of the politicians heading Illinois government to agree on a strategy to make up the deficit. The state’s Republican governor seems intent on leveraging the crisis to cut taxes and services, solutions that are unacceptable to the Democratic majority in the legislature. The impasse has led to great uncertainty both as to future tax rates and the continuing availability of public services. 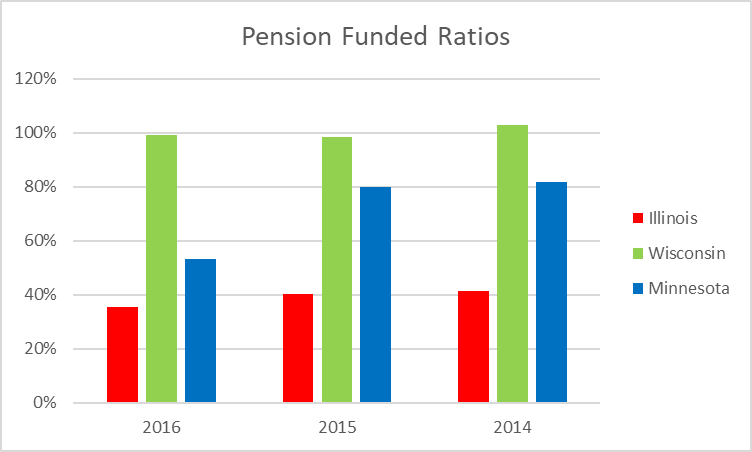 In the short run, not fully funding pensions can be very attractive to elected officials. Two actions are almost guaranteed to bring down the wrath of one or another group of angry voters: raising taxes and cutting services. Promising more generous pensions to employees, instead of more pay, shifts the problem of paying for the pension to the future. Who knows what the next election will bring? It is disappointing, but not surprising, that governors, legislatures, and other elected officials fall to the temptation. Failing to adequately set aside funds for future retirees is not conservative governance; nor is it liberal governance; it is simply bad governance. There seems to be some evidence that divided government makes the problem. Each side can point to the other as the culprit: Democrats for expanding programs, Republicans for refusing to fund the pensions. According to Pew, Illinois is not even the worst case at least in 2016, the last year for which data are available. Two other states—Kentucky and New Jersey—are worse. Although accounting standards are getting more stringent. There is still a lot of room for squishiness. Determining the soundness of retirement accounts requires projections of the account’s future returns and of the future payouts. Both offer abundant opportunity for manipulation. Consider Minnesota’s 2016 pension shock. The projected cost of its obligations jumped from $75 million to $109 million between 2015 and 2016, causing its ratio of assets to liabilities to fall from around 80% to 53%, resulting in Minnesota plunging from 18th place to 43rd place in Pew’s estimation. Although Illinois is widely viewed as a blue state because of its recent record of supporting Democratic presidential candidates, from a “who pays” angle it looks much more like a red state, collecting a much higher proportion of taxes from low earners than high earners. 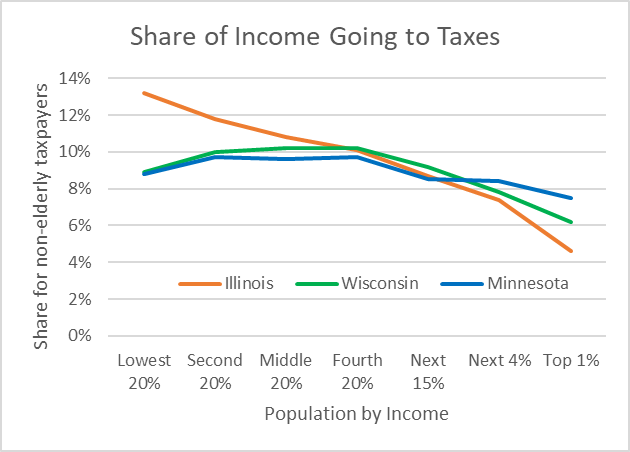 The next chart, based on data developed by the Institute on Taxation and Economic Policy (ITEP) shows that low-income Illinois residents pay a substantially higher proportion of their income than those with higher incomes, particularly the top 1%. 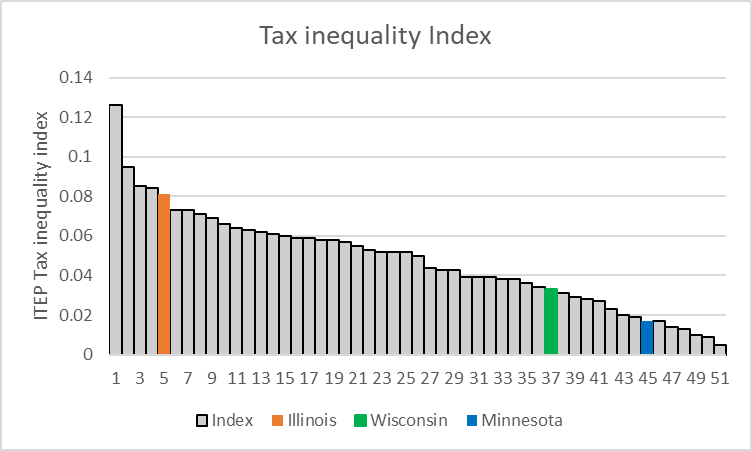 ITEP has also developed an index of tax inequality, arranging the states (including the District of Columbia) in order of decreasing inequality, puts Illinois as the fifth most unequal in the tax burden, as shown in the plot below. Wisconsin and Minnesota come in at 37th and 45th respectively. The explanation for Illinois’ low fairness, is that its income tax is a flat tax, as required by the state’s constitution. Thus, unlike in Wisconsin and Minnesota, it is unable to compensate for inherently regressive taxes, notably sales taxes. This conclusion is confirmed by the conservative American Legislative Exchange Commission (ALEC), a group driven by its belief that America suffers from too little inequality. Thus, ALEC waxes enthusiastic about this lack of progressiveness. 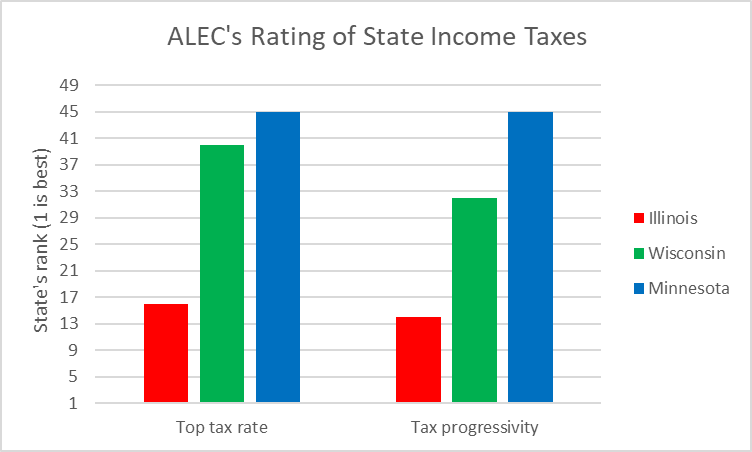 In response to its pension crisis, the Illinois legislature overturned the governor’s veto to raise the income tax rate from 3.75% to 4.95%, causing ALEC’s rating of Illinois progressiveness to decline from 12th to 16th. ALEC’s enthusiasm for the regressiveness of Illinois’ taxes doesn’t extend to others of the state’s policies. ALEC is particularly unhappy with Illinois’ inheritance tax and lack of a right-to-work law. As a result, it rates Illinois 48th overall. It appears that the Illinois economy is likely to suffer so long as its political establishment is unable to agree on how to pay for the commitments it has made. Doing so would be eased if the constitution were amended to allow graduated taxes. Without that change, low-income taxpayers will be particularly hard hit. Whether or not the constitution is changed is likely to depend on the outcome of this November’s election. The Democratic candidate for governor has endorsed amending the constitution. By contrast, the Republican incumbent seems to believes that the answer lies in cutting public programs. Illinois residents will be relieved to know that higher taxes will deliver them from their economic quagmire. From what I read 98% of taxpayers would receive a tax cut. Just those poor unfortunate 2% ers would pay more. Sounds like good policy to me. Bruce Thompson says that the MPS pension is not well-funded. That is incorrect. 100% of all MPS employees are in either the state or city pension system, which is fully funded. There is a small supplemental retirement pension for some teachers and administrators, which is being phased out. This conclusion is confirmed by the conservative American Legislative Exchange Commission (ALEC), a group driven by its belief that America suffers from too little inequality.-Bruce Thompson. Bruce, can we agree that California a progressive state has less economic inequality than Texas a red state. Kudos, to becoming a pretzel in justifying that Illinois which has a governing body that has been controlled by Democrats for twenty years has only a sizable share responsibility for the blame. IL simply has built way too much infrastructure. Too many highways, too many bridges, too much rail, oversized airports. There is not enough tax base to maintain it all while keeping schools, police, health care, and other basic government functions going. The choice left is bigger liabilities, cut important services, or delayed maintenance. Same thing is happening in Michigan, New Jersey, Connecticut. All these places were sold in 1950s as “business friendly” suburban dreamlands… but spreading out horizontally instead of embracing some density just means lots and lots of road and sewer to maintain with a stagnant tax basis. I see it as foreshadowing for the rest of the country, that’s a couple decades behind on embracing this sprawl model. Omitted from this discussion is something that is almost always a significant contributor to this kind of fiscal mess: high levels of public corruption, an area in which Illinois is a perennial national leader. life is great here: JOIN US! I lived there for 15 years before moving back to Wisconsin. Believe me, it doesn’t matter who is governor. As long as Mike Madigan is in power nothing will change. @dragonkat Come. On. Illinois has been a mess long before Bruce Rauner came around.